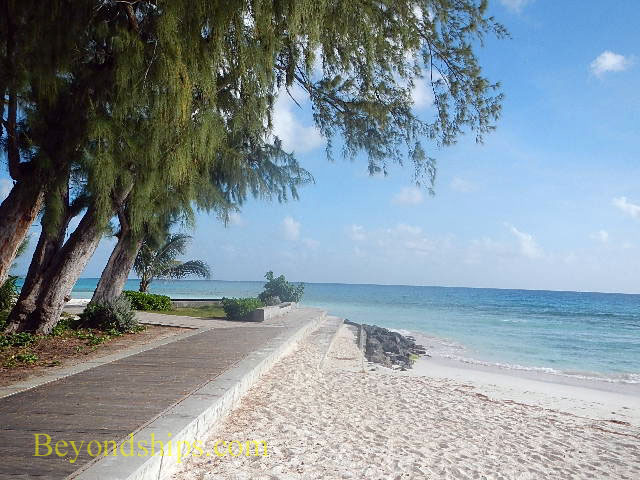 The south coast of Barbados has some very fine beaches. Because of this, the area has attracted a significant number of resorts, restaurants, shops and bars. While not as exclusive as the west coast, this is nonetheless an up-market area. For cruise passengers visiting Barbados for a day, a problem has been how to get to these beaches. You could take a taxi to one of the beaches but that involves knowing which one to go to and, of course, there is the problem of finding a taxi to take you back to the cruise port before your ship sails. 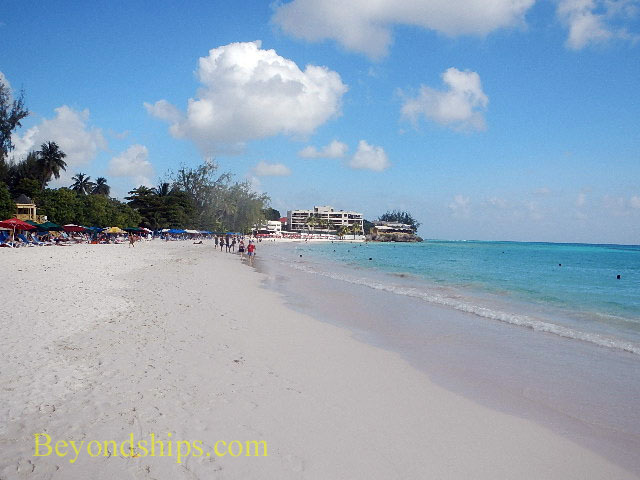 Addressing these issues is a shore excursion called the “Barbados Beach Hop Island Style.” It takes its participants to three of the more popular south coast beaches. Along the way, some places of interest are pointed out. And, there are unlimited drinks included. The transportation is not a luxury vehicle. It is a former school bus painted in bright Caribbean colors making it reminiscent of the popular Kukoo Kunuko bus in Aruba. In order to get to the south coast, the bus goes through Bridgetown. Heroes Square, the Parliament buildings, the government headquarters, the Main Garrison, the race track and the George Washington House are all pointed out by the guide talking over the bus' public address system. 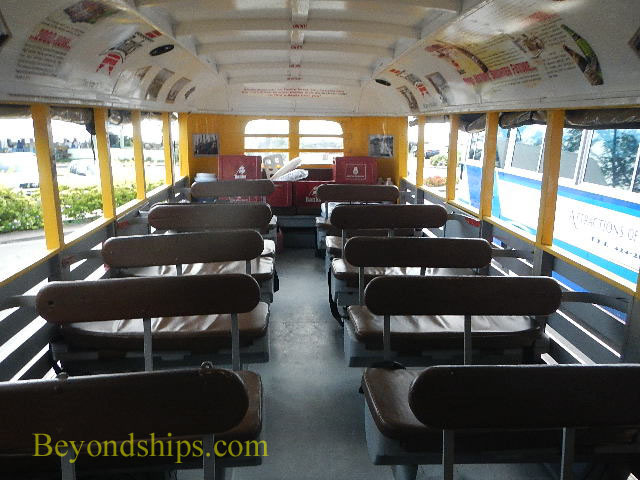 Above and below: Exterior and interior views of the bus. After a short ride, the bus passed through St. Lawrence Gap, which has become one of the island's most popular districts for eating and drinking. Then on a little further to Dover, with its modern hotels and resorts. 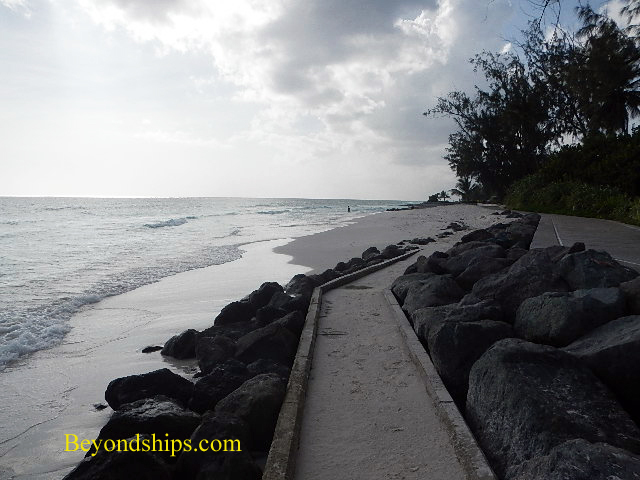 Dover Beach was the first stop. However, before going off to the beach, the guide opened the bar. Participants were offered a selection of rum-based drinks, a local beer, soft drinks or bottled water. There was no additional charge for the drinks and participants could return for refills. This same procedure was followed at each of the three beaches we visited. 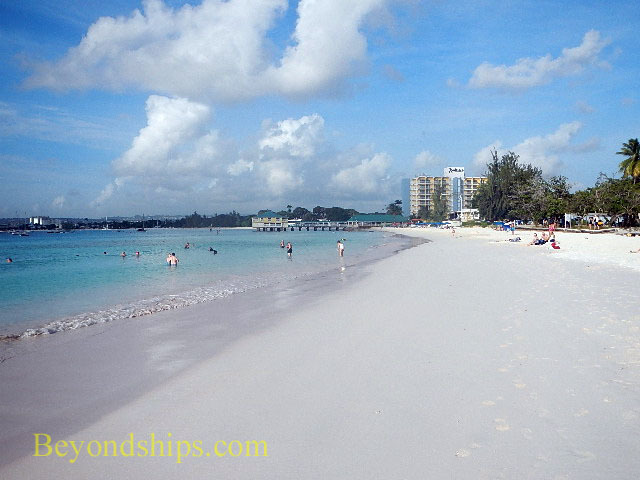 The beach itself is a wide expanse of white sand. Among the shade trees that border the beach are hotels and resaurants. Chairs and umbrellas were available for rent. 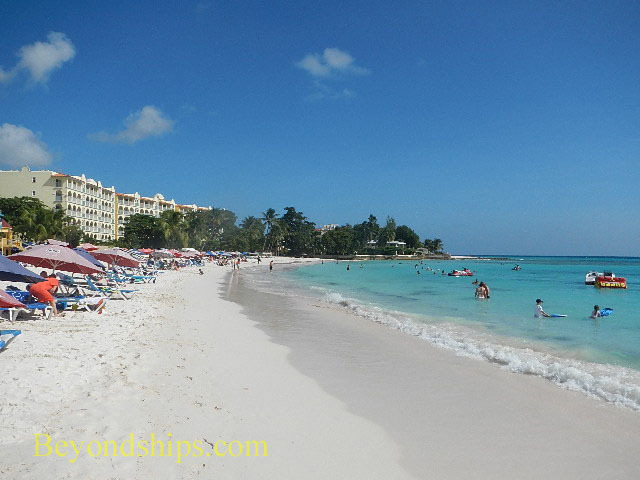 The next stop was Accra Beach, Not as wide as Dover Beach, Accra is also a white sand beach. It is also bounded by shade trees. Accra is one of the island's most popular beaches. Accordingly, it has food stalls and facilties bordering the beach. Umbrellas, chairs and various sports equipment can be rented. There were fewer people as we walked along the beach. 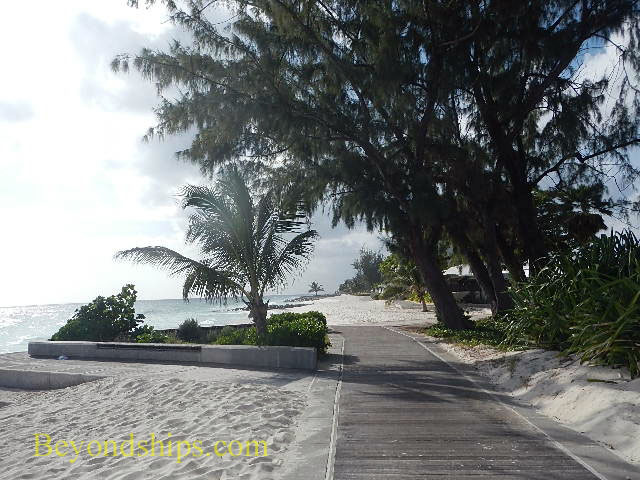 If you walk all the way to its western end, you come to a paved path known as the South Coast Boardwalk that takes you by some more secluded beaches intermixed with rocky shoreline. Our final stop was Pebbles Beach. Despite the name, this is a sandy beach. 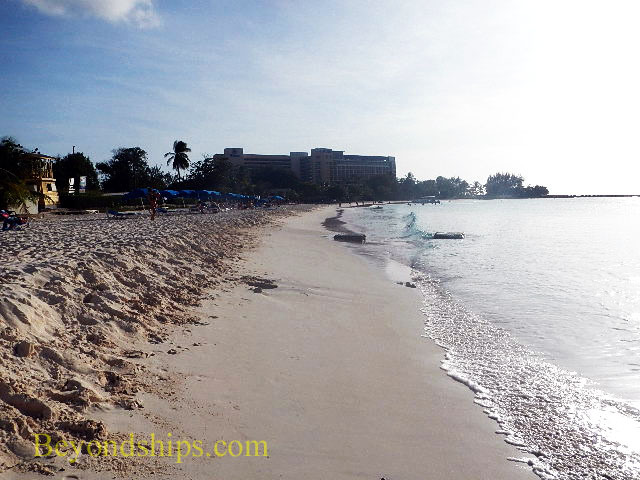 It is one of the beaches along Carlisle Bay just outside of Bridgetown. Because it is in the bay, the water here is more sheltered and thus calm. This beach is not restricted to humans. Located near the race track, grooms often bring horses down to the beach to frolic in the surf. In addition, sea turtles sometimes use ths beach to lay their eggs. We spent about an hour at each of the beaches. The guide and the driver were both friendly and chatted with participants at each stop exchanging tales of travel and life in Barbados. A few of the participants went in the water but most chose to relax in the sun or stroll along the sand. Everyone seemed to enjoy the variety of experiences and relaxed atmosphere.